Your guests are sure to make note of this elegant and useful cross note pad favor. A perfect keepsake for religious occasions of all kind, this decorative memo pad is a great way to share the blessings of a special day with family and friends. 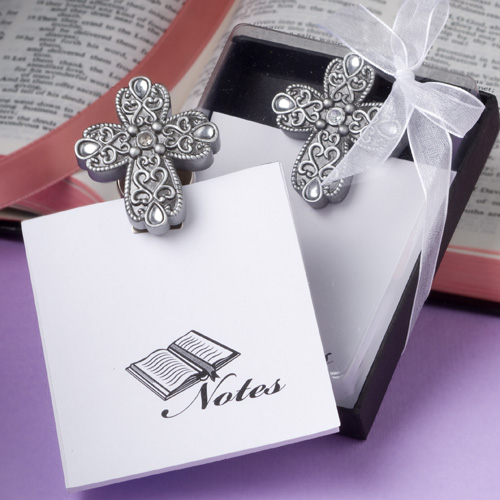 Each memo pad measures 4 ½" x 3" and features a dramatic pewter finish polyresin filigree design cross shaped charm, enhanced with glistening rhinestones, atop a magnetic metal clip for easy attachment to the fridge. A Fashioncraft exclusive from the Notes Collection, each comes with note pad included in a clear-topped box with a black base, tied with a white organza bow. You may also purchase personalized hang tags or stickers for this item. If you select the hang tags they come pre-punched with a round hole and include a 5" long white elastic string (not attached). You have your choice of tag/sticker shape - Diamond (1.75" x 1.75") or Round (1.75" diameter), background color and design.